INGREDIENTS: Sugar, Rice Flour, Potato Starch, Fat Reduced Cocoa Powder (8%), Tapioca Starch, Maize Flour, Buckwheat Flour, Raising Agents (Calcium Phosphate, Sodium Bicarbonate). You Will Need:2 Medium Eggs and 60g Dairy Free Spread (alternatlvely, use unsalted buter or margarine instead of the dairy free spread). 1. Pre-heat the oven to 180◦C/160◦C Fan/ 350◦F/ Gas 4. 2. Line the base and sides of a 7 inch square baking tin with greaseproof paper making sure the paper sticks out 2.5cm (1 inch) above the rim of the tin. 3. Melt the dairy free alternative in a small microwavable bowl. 4. Empty the brownie mix into a large bowl and add the eggs and melted spread to the mix. Using a wooden spoon mix until the batter is smooth and glossy. 5. 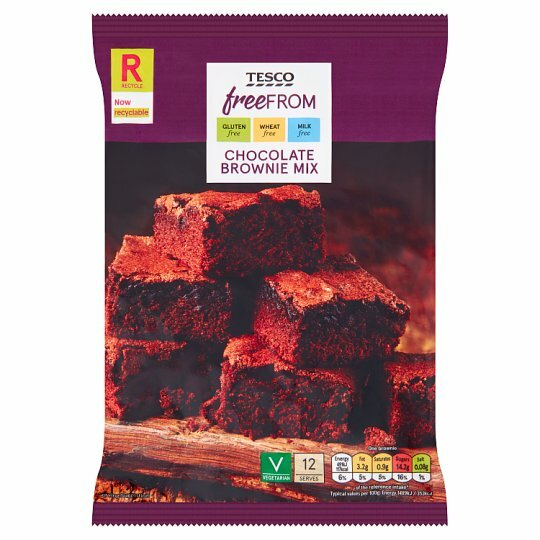 Place in the preheated oven and bake for 18 minutes for a gooey brownie and 22 minutes for a firmer brownie. 6. Once baked, leave in the tray for 10 minutes to cool before removing and serving.